I wasn't sure if I was going to make this post because I am not one to put very private things out in the open for people to see. I know I know you're thinking ummm well she has a blog.... but I don't put truly private things on here. But then I said to myself what am I afraid of? People can judge, people can make fun and laugh, but in the end it doesn't affect me. For the past few years I have been struggling with my weight. I was a solid 110lbs soaking wet when I started dating my, now, husband. And within that transition from being single to dating I also, begrudgingly, quit smoking. I was smoking 2 packs of Cowboy Killers (Marlborough Red's) a day! A DAY! For 6 years. Gah the money I spent! So that in itself set me up for immediate weight gain, which at that point I needed. And I was also very happy. We starting eating out, ordering in, ect. So let's fast-forward to last year. I had gained a lot of weight. My husband, the wonderful man he is, loves me no matter what I look like, but I had been struggling over the past few years to get the weight off. And then I got pregnant. We had been trying all of about 2 days and BAM we're expecting a precious baby boy! Clearly I wasn't supposed to lose weight while pregnant, so I didn't. My midwife told me, even though I was a bit over weight, I was extremely healthy. I only gained 28 lbs during pregnancy and delivered a 8lbs 4oz boy! But then I struggled with nursing, and wasn't able to lose a lot of weight after I had him. In fact, I gained a little more weight. I struggled with postpartum depression, which hurt my weight loss and my body was doing everything it could to hold on to every calorie it could for my milk supply. That being said, I knew I had to do something. I am not happy with how I look and feel. It is time for change. 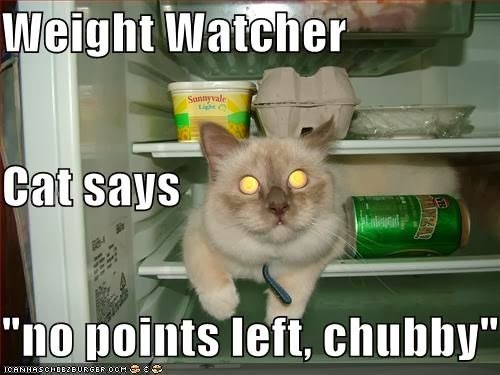 That's when I decided to turn to Weight Watchers. Now this is not my first go-around....or even second or third. No, that's right, this is my fourth time! But all the other times, even though I had great success, I did it for the wrong reasons. I did it because I was going somewhere tropical and wanted to shed a few pounds before laying on the beach. Well this time I'm doing it for my health. I'm doing it as a lifestyle change not a quick fix. I have started cooking a lot more at home and you will now see that my recipes will have the Weight Watchers Points Plus value at the bottom. Not only is this for those of you who are WW members, but for me so I don't have to recalculate each time I make the meal! So there you have it. Every Wednesday afternoon I will now be taking an hour to myself to attend the local meetings. My husband is so incredibly supportive of me and is helping me to succeed without any judgement. I am no longer afraid to admit that I am a Weight Watchers Member because at least it shows that I am taking care of myself. I have found myself amongst such a supportive group of people every single Wednesday that is going through the same thing as me. So if people read this and judge, I just know that I have that many more next to me ready to applaud when I speak up at our weekly meetings. Good for you! It's so brave to start something like that, especially if you didn't have success the first few times. But hey if you were able to quit two packs a day (a former smoker myself, I KNOW) then you definitely have it in you to adopt a healthier lifestyle in regards to food as well. Go get 'em girl! Looking forward to some WW recipes! A few of my family members are on it so ill send them your site! Best of luck! Thanks for sharing! I've gained 30 pounds the past few months. Even though I'm not super over-weight, it still kills. Gaining weight is a happiness buzzkill. Doing programs (healthy ones) to get back on track are nothing to be ashamed of. Just remember a diet that's a lifestyle change is for life, while a temporary diet shows only temporary results. Hope to hear more from you soon!! Hey! New follower here from Let's Be Friends linky. This is awesome. 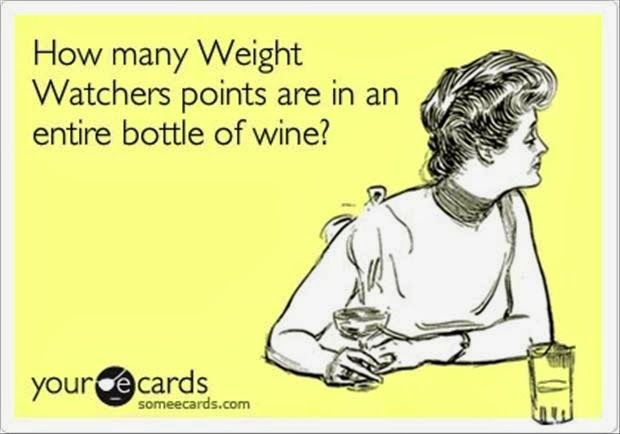 I especially love the weight watchers wine ecard! Good for you for being proactive about your weight and health.